These tasty skewers are ideal for a summer BBQ with your family. 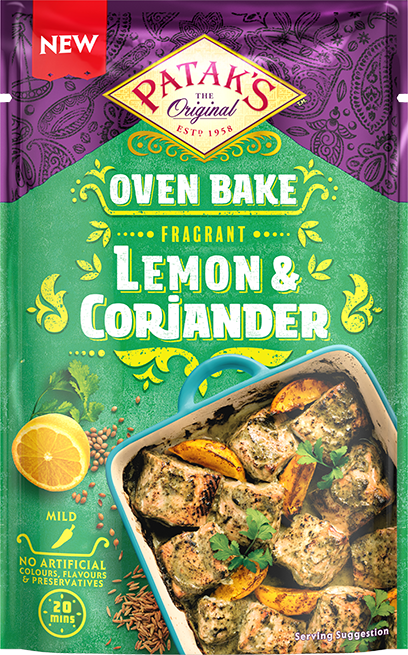 Patak's new Lemon & Coriander Oven Bake is a quick & easy marinade. Made with fresh coriander, zingy lemon juice and a special blend of Patak's herbs and spices, it's the perfect way to easily create a delicious meal which is mild in heat level, but full of flavour. Pre-soak all the bamboo skewers in water, as this will prevent the bamboo from getting burnt while cooking. Mix all the ingredients in a mixing bowl, along with a packet of Lemon & Coriander Oven Bake marinade. Leave the ingredients to marinate for at least 20 minutes. Arrange the ingredients neatly on the skewers- you should be able to make around 8 skewers with your mixture in the bowl. Cook the prawn skewers for 5 minutes, at 200c in a pre-heated oven. Arrange the marinated ingredients on the bamboo skewers- you should be able to make around 4 skewers with your mixture in the bowl. In a pre-heated oven at 200C, cook the skewers for 10-12 minutes. Check that the chicken is cooked through before eating. Serve one chicken and two prawn skewers per person, along with potato skewers, half a lemon and mango chutney.